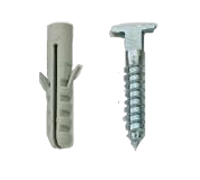 These fittings are for fixing solid aluminium frames to the wall. The screws are inserted into the rawlplugs with the heads matching the slot in the back of the aluminium frame. The frame is then pushed to the wall & the heads of the screws are turned 90 degrees with the special spanner locking the head into the rear section of the aluminium frame. The frame can only be removed from the wall with the spanner. These are commonly used for displaying artwork in public places, such as hotel rooms & restaurants.